As the world watches arms flows to and through conflict zones in Syria, Yemen and elsewhere exacerbate humanitarian disasters and civilian suffering, countries from around the world met last week on the occasion of the Third Conference of States Parties (CSP3) to the Arms Trade Treaty (ATT). The ATT, which regulates the international trade of conventional arms, is arguably one of the most important tools that policymakers could use to stop the deadly transfer of weapons to these and other war zones — that is, if leaders exhibited the political will to effectively implement the treaty and abide by their legal obligations. The meeting, which was held from 11-15 September in Geneva, Switzerland, had global participation, with 79 of the 92 ATT States Parties in attendance. Twenty-three signatory states, including the United States, and four observer states, including China, also attended the meeting. Around 75 civil society participants also attended, the majority with the international Control Arms Coalition. CSP3 was the third opportunity for countries to take stock of efforts to regulate the global arms trade and assess ATT implementation. The treaty was adopted by the U.N. General Assembly in 2013 and entered into force in December 2014. Ambassador Klaus Korhonen of Finland served as President of the CSP, with Australia, Bulgaria, Guatemala, and Sierra Leone serving as Vice Presidents. The high-level opening segment featured remarks from the Foreign Ministers of Finland and Switzerland, as well as the U.N. High Representative for Disarmament Affairs, the President of International Committee of the Red Cross, and Radhya al-Mutawakel, a Yemeni human rights defender who represented civil society and described the realities of life in Yemen and the horrors experienced by innocent civilians on a daily basis. Her testimony, which provided a first-hand testimony of the impact of unregulated and irresponsible arms sales, was a sobering reminder of the purpose of the treaty and the work required to ensure its effectiveness. Although the opening segment of the meeting underscored the importance of focusing on the dire realities faced by so many communities living in conflict zones, the focus of the meeting quickly devolved from substance to procedural issues as the week went on. Rather than discussing the implications of irresponsible arms transfers, states chose instead to focus primarily on the bureaucracy surrounding the ATT Secretariat and the treaty’s functionality, the operation of the state-sponsored Voluntary Trust Fund that is intended to assist states with treaty implementation, and the discussion of working group reports, which had been circulated prior to the conference. Buried amid the paperclips, there were few bright spots to identify meaningful discussion on ATT implementation and effectiveness. One area of substance was the focus on the linkages between the ATT and the Sustainable Development Goals. However, this is a relatively uncontroversial thematic discussion. States often agree to stop illicit flows of weapons, but it is regulating the legally traded arms that is necessary to stop the damaging consequences of arms on development. Another substantive issue that was discussed was treaty reporting, which serves to advance transparency in the global arms trade and thus support a key principle of the ATT. Only 72% of States Parties have thus far submitted their initial reports on treaty implementation, while 64% of States Parties have submitted an annual report documenting arms exports and imports in 2016. Reporting is a mandatory obligation and should be at 100% compliance. Participants at CSP3 discussed recommendations to increase reporting levels and provided an FAQ document to address common reporting challenges. Excellent side-events were held throughout the week with significant research findings on treaty implementation presented, such as on reporting experiences and synergies between international instruments related to the conventional arms trade, as well as human rights and international humanitarian law and the ATT. One diplomat said on the panel of one such side event that these are the kinds of discussions that should have been happening in the plenary and during the working groups. The Conference was not without irony. For example, states adopted tentative terms of reference to the Working Group on Transparency and Reporting that allows meetings to be closed “as necessary.” Not only could this result in tremendous wasted resources for meeting attendees that would not be allowed to participate, but closing meetings to discuss ways to support transparency is not exactly a great way to advance transparency. States also agreed to maintain a list of national points of contact for the ATT, but to do so in a way that only allows States Parties to the treaty to access the list — thereby undermining not only transparency but effective ATT implementation. In its final administrative actions, CSP3 elected Ambassador Nobushige Takamizawa of Japan as the President of the Fourth Conference of States Parties. Japan announced CSP4 would likely take place in Japan between August 20-24, 2018. Informal preparatory meetings will be held in Geneva, however. The Conference also elected Argentina, Georgia, France and South Africa as Vice Presidents to CSP4 and appointed a new Management Committee that will serve for up to two years, consisting of Cote D’Ivoire, Czech Republic, Cyprus, Panama, Sweden (year one) and Netherlands (year two). While the ATT is a relatively new treaty, states do a disservice to effective implementation by allowing these annual conferences to be overly focused on process and not impact. States are setting a bad precedent, and preventing meaningful implementation. A focus on universalization without equal attention to implementation gives only lip service to the treaty’s obligations. In his closing remarks, the incoming CSP4 President, Ambassador Takamizawa highlighted Japan’s vision for the ATT for the next year. He said that his wish is for the ATT to stand for action, transparency, and trust. 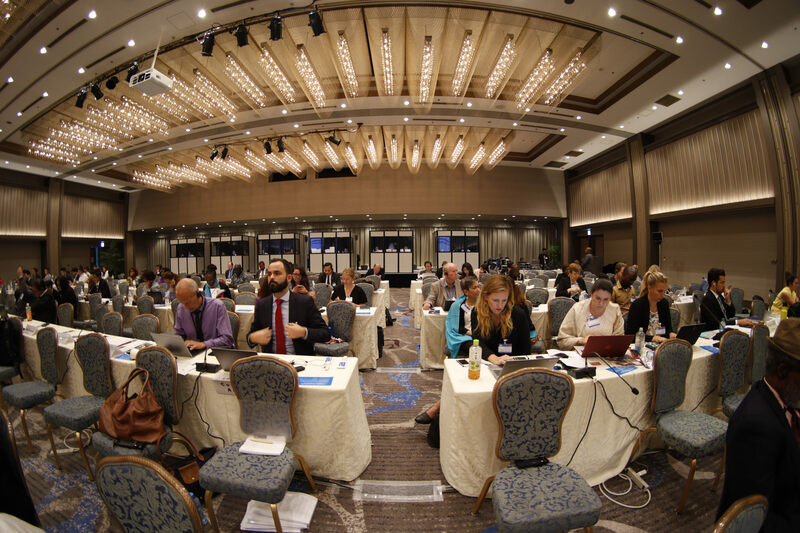 Only time will tell if states will finally focus on areas of substance at CSP4 and discuss treaty implementation to help the ATT meet its potential to reduce human suffering by regulating the global trade in conventional arms. Rachel Stohl is the director of the Conventional Defense program at the Stimson Center.